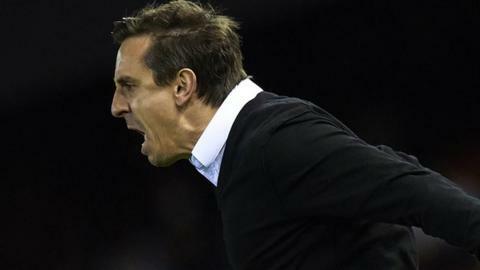 Gary Neville was relieved to earn his first league win as Valencia manager but said there would be no celebration as he still has a big job to do. Valencia claimed their first win in 10 games under Neville with Saturday's 2-1 victory over struggling Espanyol. "I'm happy with it, but it's just one small step forward. Relief is probably a good word," said Neville, 40. "Fans and media have been within their rights to say the things they are saying. I'd have said the same." Espanyol had lost their last eight away league games but went ahead through a Oscar Duarte header after 52 minutes, continuing Valencia's record of never having led a league game under Neville. The home side equalised when substitute Alvaro Negredo scored with a deflected effort in the 71st-minute. And on-loan Real Madrid winger Denis Cheryshev then headed the winner as Neville's side moved seven points clear of the relegation zone. England coach Neville admitted this was a game he needed to win after overseeing four defeats and five draws in the league since taking on his first managerial position in December. The former Manchester United captain had come under pressure from supporters following the poor run of results and a 7-0 loss at Barcelona in the first leg of their Copa del Rey semi-final. Valencia finished fourth last season, but had not won in the league since 7 November going into Saturday's game. "The fans were incredible tonight, especially when we went 1-0 down," said Neville. "They stayed with every single player, and me, and I am grateful for that. "The game tells us that football is not about putting on the best performance. But today we got the result. "It's not a night for any celebration whatsoever, not to get carried away. We'll gain some confidence from the result. There's a good feeling from the dressing room and we'll take things forward." Meanwhile, Neville has added former Liverpool and Valencia assistant manager Pako Ayestaran to his coaching team. Ayestaran will supplement Neville's existing staff, which includes brother and ex-Manchester United team-mate Phil Neville. Ayestaran, 53, was Valencia's number two between 2001-04 before filling a similar role for three years at Liverpool under Rafa Benitez and has since managed in Israel and Mexico. Match ends, Valencia 2, Espanyol 1. Second Half ends, Valencia 2, Espanyol 1. Attempt blocked. Enzo Pérez (Valencia) right footed shot from outside the box is blocked. Assisted by Paco Alcácer. Corner, Valencia. Conceded by Óscar Duarte. Corner, Espanyol. Conceded by Aderlan Santos. Attempt missed. Gerard Moreno (Espanyol) left footed shot from the left side of the box is close, but misses to the right. Assisted by Víctor Sánchez with a cross. Attempt missed. Pape Diop (Espanyol) right footed shot from outside the box misses to the right. Assisted by Víctor Álvarez. Foul by Víctor Álvarez (Espanyol). Substitution, Valencia. Antonio Barragán replaces Denis Cheryshev. Delay in match Diego Alves (Valencia) because of an injury. Attempt missed. Gerard Moreno (Espanyol) left footed shot from the centre of the box is close, but misses to the left following a corner. Attempt saved. Álvaro González (Espanyol) right footed shot from the centre of the box is saved in the top centre of the goal. Corner, Espanyol. Conceded by João Cancelo. Attempt blocked. Marco Asensio (Espanyol) left footed shot from the centre of the box is blocked. Substitution, Espanyol. Enzo Roco replaces Burgui because of an injury. Attempt missed. Sofiane Feghouli (Valencia) right footed shot from outside the box is too high. Goal! Valencia 2, Espanyol 1. Denis Cheryshev (Valencia) header from the centre of the box to the bottom left corner. Assisted by Sofiane Feghouli with a cross. Attempt missed. Óscar Duarte (Espanyol) header from the centre of the box misses to the right. Assisted by Burgui with a cross following a corner. Attempt blocked. Marco Asensio (Espanyol) left footed shot from outside the box is blocked. Assisted by Javi López. Goal! Valencia 1, Espanyol 1. Álvaro Negredo (Valencia) right footed shot from the centre of the box to the bottom right corner. Assisted by João Cancelo. Attempt blocked. Álvaro Negredo (Valencia) header from the centre of the box is blocked. Assisted by Daniel Parejo with a cross. Corner, Valencia. Conceded by Víctor Álvarez. Attempt missed. Burgui (Espanyol) right footed shot from outside the box is just a bit too high. Assisted by Marco Asensio. Substitution, Espanyol. Víctor Sánchez replaces Felipe Caicedo.